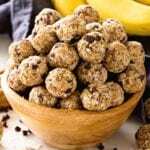 Delicious Recipe for Energy Bites Loaded with Chocolate Chips, Banana, Coconut, Oats, Flaxseed, Chia Seeds and Spiced with Cinnamon! Mix all ingredients together in a mixing bowl. Refrigerate for 1 hour. Refrigerate for up to one week or freeze.